Home / Adelphia Medical Inc.
Adelphia Medical Inc., an FDA registered medical supply company, approached us with one simple goal in mind- optimizing their search engine ranking results. Adelphia Medical Inc., an FDA registered medical supply company, approached us with one simple goal in mind- optimizing their search engine ranking results. As our client they briefed us about the market situation and their expectations with this project. Search Eccentric’s team analyzed their SEO problems and presented them with a strategy that was approved at one go. We searched for and corrected the missing links in Adelphia Medical website’s on-page SEO structure, and completed the equation for their number one ranking on Google. The results started flowing on the back of our SEO work, and Adelphia Medical Inc. witnessed a 1449 % jump in their overall inbound visitor traffic (organic, direct, referral and social) between November 13, 2013 and January 14, 2013. In six weeks (December ’13 and February ’14), the Search Eccentric team had put adelphiamedical.com on top of Google SERPs for 6 of their business’ money keywords. At the onset, we examined adelphiamedical.com and found its on-page SEO to be compromised. Once we had an accord with the client regarding the website’s optimization strategy, our expert panel of SEO experts and digital marketing professionals went to work. The website, adelphiamedical.com, had several degenerate factors working against its SEO, and our job was to find and eliminate them. We found these fundamental building blocks of an effective SEO campaign lacking discipline on the adelphiamedical.com, and the reason for this website’s non-existence on SERPs. 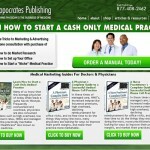 Search Eccentric’s SEO team audited the adelphiamedical.com for its ranking issues. It was clear that it needed an impactful recovery strategy, for which we carried out a thorough market analysis, competitive keyword research and on-page optimization groundwork. The client and our team were in agreement that this website required a comprehensive SEO remodeling. The Search Eccentric SEO panel started off with the basics including removing canonical issues, broken (or not found) links and duplicate content. The next step needed correction of missing H1, H2, H3 and ALT tags, meta description, anchor text and other on-page errors, which laid the foundation for the real expert-level search engine optimization work. The broken links were checked and fixed, while footer links were customized and corrected for the on-page SEO, while the necessary off-page work continued in the background. Following the aforementioned measures, our SEO team upturned adelphiamedical.com by revamping its internal linking architecture and implementing an effective Silo remodeling. Henceforth, the results started coming and Adelphia Medical began appearing on Google’s SERPs organically. We devised a comprehensive off-page optimization strategy that was to be put into action throughout the course of this project. The off-page work involved submission of high quality blog posts, PDF submission, PPT slide sharing and social bookmarking on websites with high Page Rank (PR) and Domain Authority (DA). We completely remodeled Adelphia Medical’s content marketing strategy by sharing whitepapers on their niche services, besides incorporating engaging infographics and video marketing tactics in the campaign for targeting US clients. Since Google’s Penguin algorithm update came into effect, Search Eccentric’s expert panel has embraced quality content submission on high PR and DA websites along with other intrinsic SEO practices for enhancing both organic and referred inbound traffic. Other areas improved from SEO perspective comprised geo location suggestion, creation of Robots.txt file and XML site mapping. We had also setup Google Analytics and Webmaster accounts for adelphiamedical.com in order to monitor the shift in organic/referral traffic coming to the website and link juice, respectively. 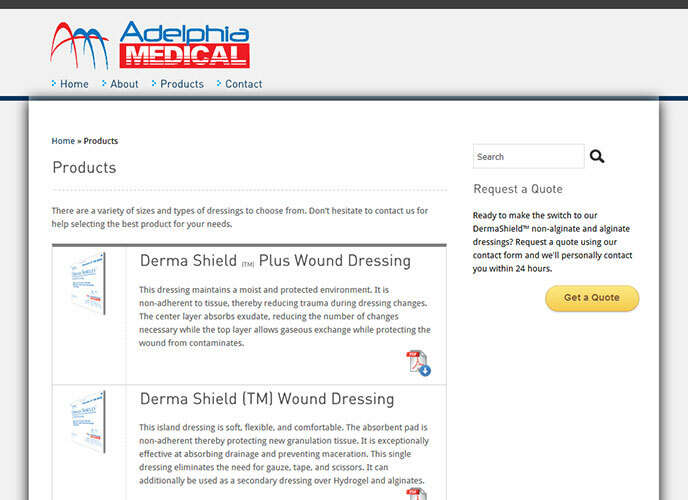 On account of our clear-cut SEO efforts, Adelphia Medical Inc. achieved their primary business objective, i.e. getting ranked on top of the search engine giant- Google for their target keywords. The success story could be better summarized with the ranking comparison mentioned in the tabular form below. Search Eccentric’s expert panel of SEO professionals had put adelphiamedical.com’s 7, 8 and 13 target keywords in the Top 10, Top 15 and Top 60 Google search results. The on-page and off-page SEO plan delivered the desired rankings, which resulted positively on driving traffic to the Adelphia Medical Inc. business website. The targeted keyword rankings were met with aplomb, and Search Eccentric proved its mettle in optimizing a website’s faulty SEO, yet gain. 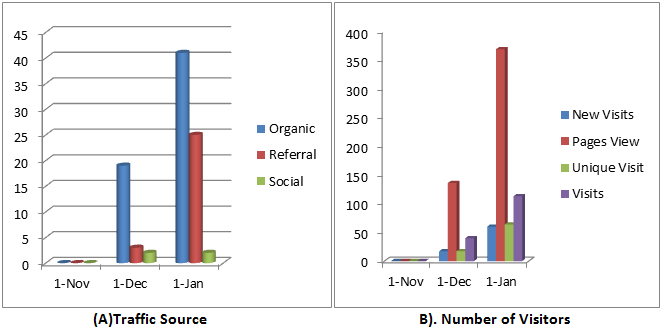 The website, adelphiamedical.com, witnessed its organic and referral inbound traffic jumping up two and five times, respectively between December 1, 2013 and January 1, 2014. The inbound visitor traffic analysis depicts contrasting difference between December and January data, besides a steep surge in the number of total page views. The client’s directives were clear at the onset about targeting and building brand awareness among its US audience, and accordingly we dedicated our SEO efforts towards achieving the same. 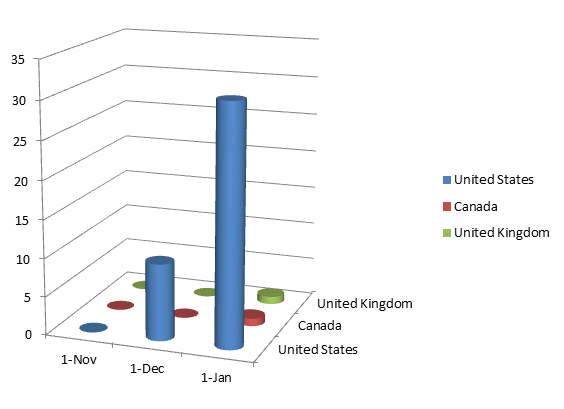 The content strategy and off-page SEO targeted US territory as our primary Geo-Location, and within a month Search Eccentric’s SEO panel had increased adelphiamedical.com’s inbound traffic originating from US soil by as much as five times.